Doughnuts . . . Mexican style! Last week I gave the recipe for traditional yeast dough, doughnuts. But suprisingly around the world doughnuts are made in many ways. 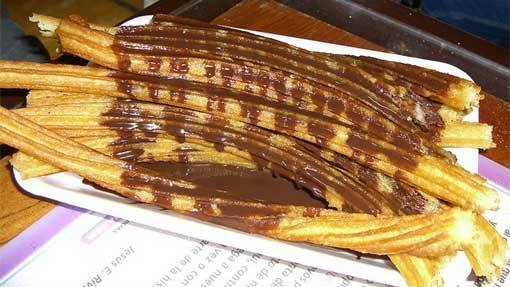 My favourite is the Churros, which is yeast free and uses eggs as its aeration agent. They are lighter than the yeast dough version and also a lot quicker to make as there is no proving required. From start to finish you can have these on the table within thirty minutes. Probably quicker than you can find the keys, get the car out of the garage, get to the nearest shop to buy some doughnuts and drive home . . . and they are so easy too! Served sweet or savoury, hot or cold, round or in long thin strips . . . these are sure to be a winner with your family and friends and you can say "Oh, just a little something I knocked up earlier" as you take their praises and compliments. Add the beaten eggs gradually, in three or four additions, mixing the dough until it is smooth each time; scraping down the sides and bottom of the bowl until all of the eggs are incorporated. If you add too much egg at once it will be more difficult and take longer to combine. It will also look like it has curdled, but continued beating will bring it back. Enjoy your Churros and bon appetit . . . . .